This is a really delicious curry which is both really easy to make and doesn’t contain too many different spices/ingredients. The chicken really benefits from marinading in the fridge for a while however I only marinaded mine tonight for around 1 hour (I’m never organised enough to do it the day before) and it was lovely! This recipe requires hardly any preparation and it’s a lovely change to your usual Indian Curry. I served it mine with a small portion of rice (included in the points) and one of Morrison’s mini garlic and coriander pittas (for an extra 5sp, a weight watchers pitta would be great too) and a large dollop of fat free natural yoghurt on top. Put the ginger, garlic and the juice of half a lemon in the blender with a small splash of water. Blend until smooth. You may need to add a little more water to the blender depending on how good your blender it is. Pop the chicken into a large bowl, cover with the ginger/garlic mixture and stir it in so it covers all the pieces. Cover with cling film and leaven in the fridge for between 30 minutes and 24 hours. Put rice on to boil with ½ vegetable stock cube. Then, in the same blender, add the tomatoes, coriander, chilli, tomato puree, a pinch of salt and a splash of water. Blend until smooth. Heat a frying pan, spray with 1Kal and add the chicken with all the marinade. Fry on a medium heat for around 10 minutes until lightly browned. After around 5 minutes, add the pepper and continue to fry. Add the tomato mixture from the blender with the cherry tomatoes , stir and cook for a further 10 minutes until mixture starts sticking to chicken and thickening up. This can take varying amounts of time depending on your cooker. If you are in a rush you can always mix a tsp of cornflour with a little cold water to make a paste, add this to the sauce and continue to simmer. One the sauce has thickened nicely, add the yoghurt and spinach, stir and simmer for another 4-5 minutes. Cover, reduce to low and cook for a further ten minutes until chicken is tender. Squeeze in the rest of the lemon juice and season to taste. 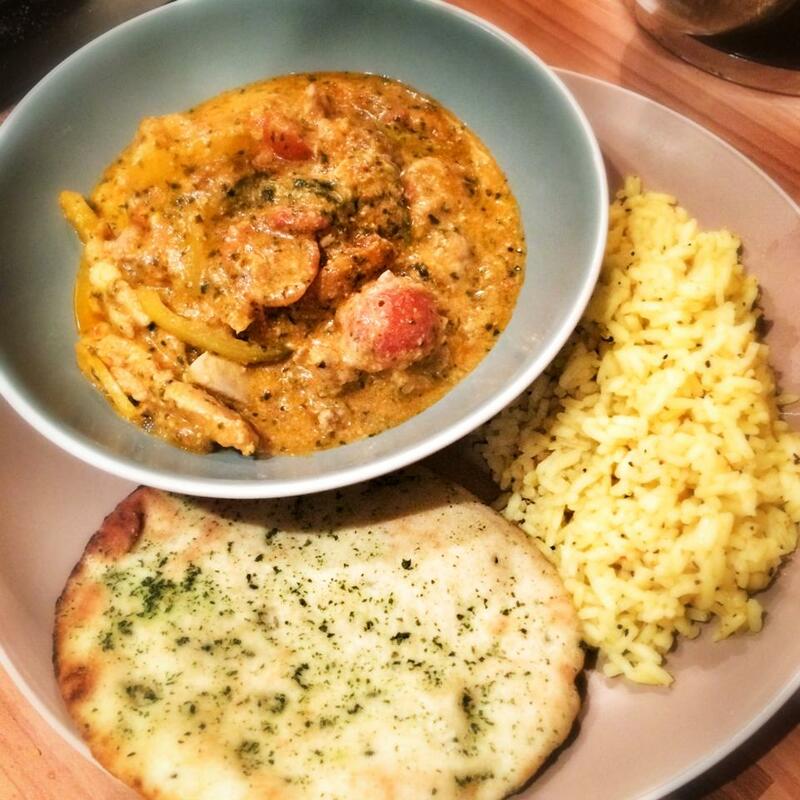 Loved this curry & already have 3 more recipes I want to try! Brilliant. Fabulous recipe although I have tweaked it and added cumin and turmeric, tastes beautiful. Do the points include the rice & naan bread?